If your rewinding speeds are higher than 500 ft/min or your tension set-point is low, it is important to have lay-on rolls to prevent air entrapment. 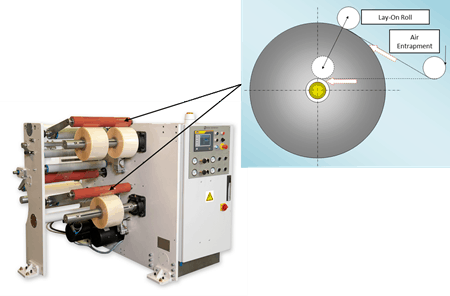 As the web moves at higher speeds, it will pull in air at the point of the rewind, and the tension of the web alone will not be enough to prevent air from becoming trapped in the finished reels. The lay-on rolls create a pinch point that prevents this. Without lay-on rolls, the finished rewind reels are more susceptible to lateral movement (telescoping). If you also have products that could be damaged by the lay-on (i.e. printed materials with sensitive inks), consider a lay-on roll with minimum gap capability so that you can run both products on the same machine.